Please let us know how you would like your gift certificate to be addressed example: "Happy Birthday Addie, Love Papa and Nana" and where to mail or email the gift certificate. Redeemable at the Livermore Music Together of Tracy locations. 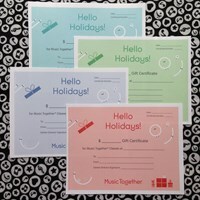 PLEASE NOTE: For families taking classes at The Grand Theatre in Tracy, these certificates cannot be redeemed at The Grand Theatre but Music Together of Tracy can help you complete your registration after you make your purchase. Below are steps to complete an order to buy a gift certificate for classes at The Grand Theatre in Tracy. 1. Purchase a gift certificate from this site. After your purchase go to step 2. 3. Let us know how you would like your gift certificate filled out. Example: "Happy Birthday Addie, Love Papa and Nana"